With outdoor kitchens becoming so popular in North Texas, it’s important to consider outdoor kitchen lighting to enhance the perfect cooking space and also create a proper dining ambiance. It doesn’t really matter if you have a small Weber grill or a total kitchen, proper lighting is a must. A couple tiki torches and a flashlight will not enrich the experience. Outdoor kitchens have become so sophisticated lately that they are really an extension of the interior of your home. Typically equipped with top appliances, the space often includes entertaining space with dining tables and comfortable furniture. These environments are a valuable addition and proper outdoor kitchen lighting is important so that you can fully enjoy the investment. Along with directed lighting for the cooking area and mood lighting for entertaining spaces, you will also want to consider safety measures. Steps and walkways should be lighted so injury to family and guests can be prevented. You will need proper illumination for all cooking areas (grill, pizza oven, griddle, etc) and all tasks areas such as a prep counter and an outdoor sink. This lighting is typically directed to a specific area and if there is not enough spill into all of the kitchen area you might want to also consider low wattage lighting in or around cabinetry so you can easy locate cooking essentials. Dimmer switches give you the option of turning down high wattage task lighting when you switch to relaxation mode. Ceiling fans can do triple duty in an outdoor kitchen – they can provide general lighting to dining areas, they can cool down the cooking area and they are pretty efficient at keeping away mosquitos. Three very important elements that will enhance your experience. North Texas weather does not often include frigid temperatures but wind and rain have been known to happen. The lighting you chose should be rated to stand up to outdoor climate conditions. If you have a covered outdoor kitchen, you can use lighting fixtures rated for damp conditions, but if your space is uncovered, you will need to use fixtures designed to withstand wet conditions. 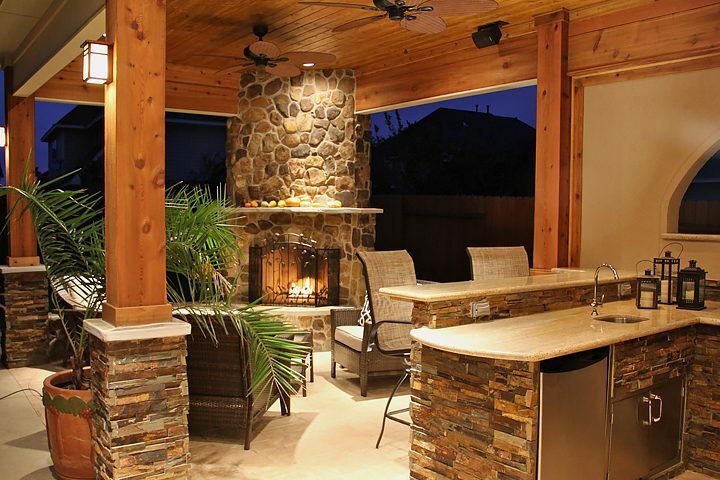 Many outdoor kitchens include a bar area that can double as prep space and as a true adult beverage bar. Your lighting choices should consider all the ways you will be using the space. For sipping cocktails and chatting, warm lighting is best. If the space might also be used for family game nights, you will need enough wattage to see game pieces and read playing cards. Rope lighting can be a fun way to illuminate around a bar area to create a festive environment while pendant lights about the bar give off terrific illumination for activity. When choosing pendant fixtures, look for ones that are stable enough they won’t be affected by high winds. Your design should include more than one circuit. Various loads – appliances, sound speakers, heating elements – should be calculated. A professional lighting designer or landscape contractor will work with an electrician to determine how many circuits will be required and how the load will be split. So far these tips have talked mostly about function and efficiency. When planning your outdoor kitchen lighting is also important to consider a style that complements your design. If you have a beautiful, high-end grill with a bare bulb hanging above it that investment will be diminished. This is where you get to be really inventive – look for fixtures with style that reflect the mood you want to create. When designing your outdoor kitchen you should pay as much attention to this space as you would to designing your interior spaces. And lighting is a vital element is achieving the look and function you desire. Hopefully these tips will guide you through the process. Your family life will be enriched significantly be creating a versatile home extension and beautiful landscape element.